Goat puppet made by Emma from Otherstory and Frances Howe, for Dignity for Asylum Seekers. 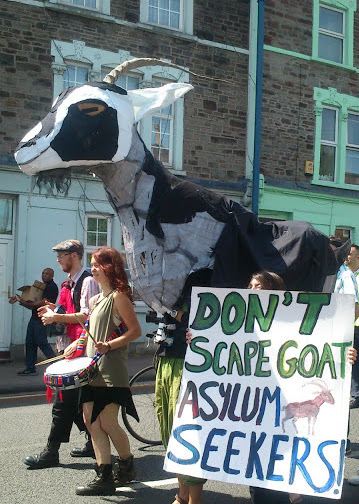 Originally made for a demo in Bristol in summer 2013, the goat has since taken part in numerous events by the campaign including the March for Dignity from Bristol to Cardiff in May/June 2014. Check out the link for an account of this remarkable journey, and more photos of the goat in action.